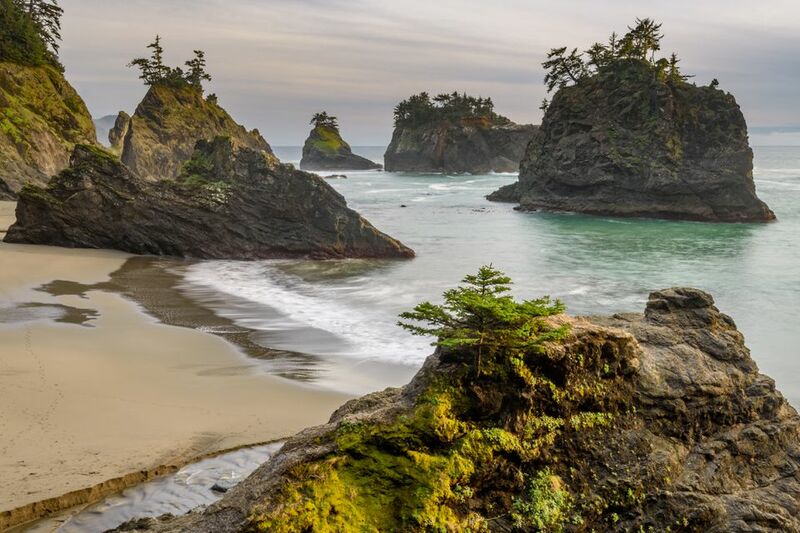 Just north of the Oregon-California border, where the Chetco River empties into the Pacific Ocean, you'll find the scenic beach community of Brookings-Harbor. Like much of the Oregon Coast, it's top attractions include an array of city and state parks that preserve the gorgeous coastal scenery for the enjoyment of the public. Extraordinary beach scenery, hiking trails, wildlife watching, and camping are all reasons to spend time exploring Harris Beach State Park. A long stretch of sandy beach is perfect for beachcombing and kite flying. Campers, who can choose from a tent, yurt, or RV sites, will enjoy ocean and forest views, a children's playground, a bicycle trail to town, and ranger-led programs. Harris Beach State Park looks right out at a rocky island that is part of the Oregon Islands National Wildlife Refuge, a nesting site for tufted puffins and other seabirds. Home to commercial and recreational boats, the Brookings-Harbor waterfront marina area is a fun place to wander and explore. You can head out on a charter fishing trip, or watch the professionals unload the freshest of ​seafood, including Dungeness crab, tuna, and shrimp. Enjoy some of these local goodies at a waterfront restaurant such as The Hungry Clam or the Sporthaven Marina Bar & Grill. The Brookings-Harbor shops and galleries are a great place to pick up a souvenir of your Oregon Coast getaway. Surrounded by water on essentially all sides, this Brookings city park offers plenty of beach and lawn space to run and play, to wander and explore. Chetco Point Park is a perfect place to enjoy a casual picnic with friends and family or to just sit back and watch the waves, the whale migration, or a sunset. This Brookings city park is a community hub complete with kids' play equipment and structures, sports fields, a performance stage, special event spaces, picnic areas, and gardens. The native azaleas are particularly gorgeous during their spring bloom time when the park comes alive with bright pinks and reds. Other plantings keep the park in color through much of the year. During the Christmas season, the park is the site of the "Nature's Coastal Holiday" light show. Located in an inland forest along the Chetco River, Loeb State Park is a wonderful place to hike in a unique ecosystem. The park's Riverview Trail will take you through a forest of Oregon myrtle trees, which eventually leads to the Redwood Nature Trail and into the adjacent Siskiyou National Forest. Alfred A. Loeb State Park is also popular for camping, fishing, and wildlife watching. Housed in a pioneer-era structure that first served as a stagecoach stop and trading post, and later became a private home, this local museum preserves the early history of the region by displaying the artifacts and furnishings of daily life. The Chetco Valley Historical Society Museum is open to visitors only during the warmer months of the year.